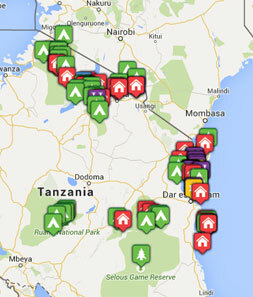 Guides: "Muro, our first-rate driver and guide in Tanzania, was very knowledgeable, considerate and likeable. In Kenya, we also had an excellent guide/driver (called Gideon? ), who was very knowledgeable about politics and socio-economics facts about Kenya. " a bit bland an experience after exciting hotels. we did not like the food. good location in Zanzibar Stone Town. our favourite hotel during this trip. The staff were fantastic â€“ very considerate, polite and enthusiastic. The food was good. Mostly, it was magical to wake up with a view on to the park, with birds singing everywhere as the sun was rising. nice, friendly staff. a bit scary at first to hear lions roar right next to the tent, so not for the faint hearted, but a once in a lifetime opportunity to experience nature and animals from very close.